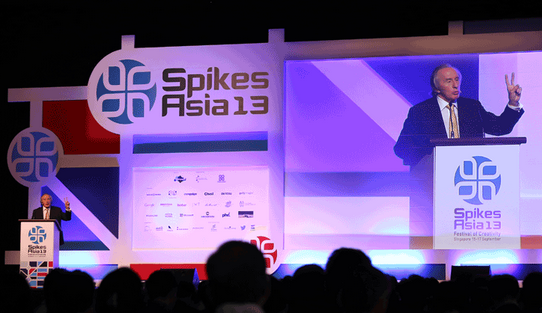 At Spikes – the big ad conference in Singapore that is created by the Cannes Lions team – all sorts of weird and wonderful people speak. Including me ! Well, the Ogilvy team had invited Sir Jackie Stewart, the Formula 1 hero – who is known for his charm and arrogance, his fast driving and racing safety advocacy and for being a story teller. Ask for advice. Find two mentors. I love that last line. It was part of his story about being dyslexic and therefore being “thick, stupid, dum” at school. When you’re not smart he says, you have to think differently to get ahead because you can’t do things in the normal way as well as the others. Ha! I met a creative director at the Spikes Awards afterparty. He told me and the headhunter I was chatting to that he knew that TVCs were about to make a comeback in the hearts and minds of marketers. Ie some people “think different” and they are the heros. Others want to turn back the clocks to their halcyon days! But that’s why Frontfoot is a great name for a consultancy. Not Backfoot.